Recently returned to New Zealand after peregrinating across the world, Talele and his quartet will present a variety of music. Deeply rooted in the jazz style, this group will endeavour to explore some more progressive territories. This is a night you won't want to miss! Kushal Talele was born in Pune, India a city just outside of Mumbai. His first formal tuition in music was on the traditional Indian drum, the tabla, for which he recalls showing no real talent. Talele moved with his family to New Zealand at the age of 8, spending his formative years between Auckland and Hamilton. Talele showed a keen interest for music in high school which led him to pick up several instruments. He quickly realized after hearing Charlie Parker that the saxophone would be the vehicle that would best allow him to express himself. After high school Kushal went on the study at the New Zealand School of Music in Auckland under the tutelage of Brian Smith and Pete France. 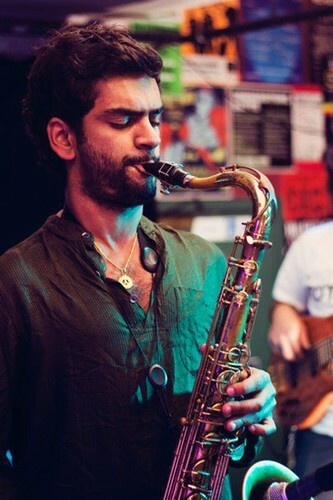 In recent years, Kushal has been based in London, where he was playing original music with his electronic group, Mooga Fooga as well as working as a sideman with some of the city’s top jazz musicians. Every Wednesday CJC presents a featured member artist or international guest in the basement bar at 1885 Britomart in downtown Auckland..